Mushrooms. Food and foe. Why foe you ask? The untimely demise of the holy Roman emperor, King Charles VI, who, while consuming his meal fell dead to the floor, led to the great war of Austrian succession. What he thought to be regular mushrooms turned out to be the dreadful ‘amanita’ or ‘death cap’ mushrooms. Unlike the poor king, our herbed chicken-steak paired with a mild, savoury mushroom sauce, one of our bestsellers, has certainly stood the test of time. 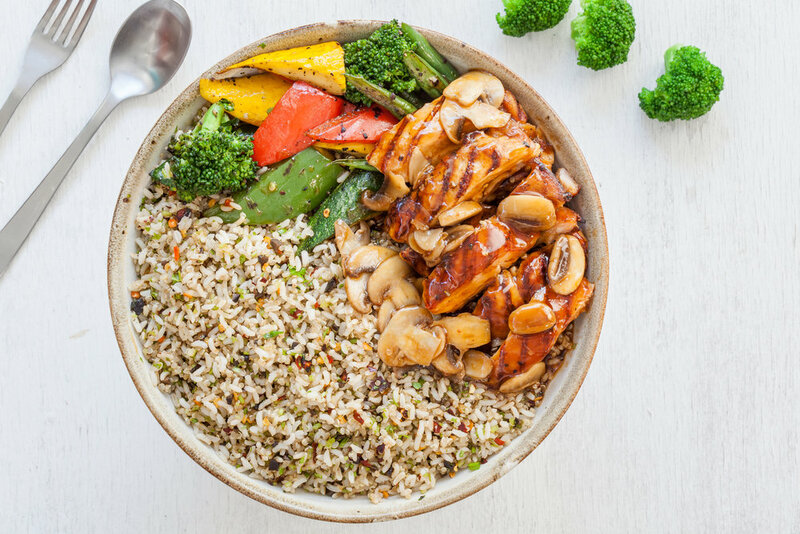 Served with quinoa-brown-rice, this KETO meal light and nutritious. Take the chicken leg (boneless) marinate it well with salt, pepper, lemon juice, dijon mustard and seasoning. Keep it marinated for half an hour. Grill it for a few minutes and finish cooking it in the oven. For sliced mushroom in black pepper flavoured sauce. Heat Oil in a pan, add mirepoix and saute it, well add chopped garlic, red wine vinegar and add the sliced button mushroom and saute it. Add chicken stock and simmer. Dilute demi-glace powder with hot water add it to the chicken stock. Reduce it add salt, pepper and in the end, add the butter. Heat butter, add chopped garlic and saute for a bit, add fresh spinach leaves add chopped black olives. Then add boiled quinoa, brown rice. Finish it with chopped parsley and butter. Make sure you adjust the seasoning. Click here for juicy steaks!